WRML. 1 Update: Anthelmintic resistance of cattle worms in NZ. 2 DPI Cattle Methane Team selected as finalists for the Australian Museum Eureka Prizes 3 Gross margins 4 Sugar toxic? To WormMail list (recip. undisclosed). In this issue: WRML. Update: Anthelmintic resistance of cattle worms in NZ. DPI Cattle Methane Team selected as finalists for the Australian Museum Eureka Prizes  Gross margins  Sugar toxic? Dr David Leathwick’s group at Agresearch, Palmerston North, NZ have now confirmed, by slaughter study, macrocyclic lactone (ML) resistance of Ostertagia ostertagi (small brown stomach worm) on three farms in the North Island. At least two of these are also benzimidazole (BZ) resistant based on a faecal worm egg count reduction test. (D Leathwick, pers comm, 15/8/13. Used with permission). Kiwi researcher DM Leathwick recently added this insight: ‘No doubt the Aussies can come up with a way to deliver underarm? ‘ (With this sort of lateral thinking, things can’t be all black). The sheep enterprise information has been updated recently (by Wagga Wagga-based Development Officer (Sheep Performance), Geoff Casburn (a proven performer himself)) and should be up on the website in a week or so. 3s and prostate cancer. 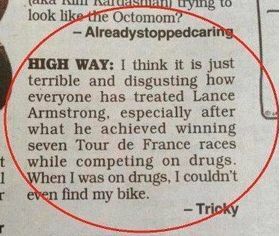 Praise for Lance Armstrong. WormMail and WordPress. Last Friday (9th Aug) the Graham Centre held a Beef Forum. Also attached is the ‘resistance’ paper, a very brief overview of resistance of cattle roundworms and liver fluke in Australia. In the paper I mention how you can check the efficacy of the drench you just gave. You can also get assistance from various quarters, including your private vet, LHPA vets/rangers, rural re-sellers (agribusinesses), and pharmaceutical companies. Question: from whence was the first reported case (according to Overend) in the world of resistance of liver fluke (Fasciola hepatica) to triclabendazole? ‘Something that stuck in my mind from Emma Whittaker’s talk on HGPs: an egg has as much oestradiol 17 beta as 77 kg of HGP-treated beef. And, I have been told that, relative to meat from HGP treated animals – there is a whole lot more in the way of oestrogens in cows slaughtered post-partum or in various parts of the oestrus cycle. ‘Makes sense really. But, back to eggs: to avoid the feminising effect of an egg at breakfast, I should eat large amounts (up to 77 kg) of beef instead? (Perhaps I should just eat lots of soy-based products – and be loaded up with phyto-oestrogens instead? Plant-based diets are necessarily nutritionally better than what omnivores eat, right?). Don’t tell anyone about the hormones (e.g. bovine insulin) in milk (Yes, there are hormones in milk. Significance?). Hormones in chicken? Well, the average joe/jill believes that intensively raised chickens are given hormones, which hasn’t been the case in Australia for decades. By the way, lest you think I am knocking vegetarians, I have a lot of respect for conscientious/thoughtful vegetarians, even if I don’t necessarily agree with all their views. And if you read (one-time vegan) Lierre Keith’s book (The Myth of Vegetarianism), you’ll find a lot therein that is confronting for omnivores (not least males) as well as vegetarians. Do you need to treat and / or test your livestock for liver fluke? The key months for this in SE Australia: April, August. February. You might recall the news some weeks ago that gave the impression that if you consume omega 3s (indeterminate amounts) you had a greater chance of dying of prostate cancer (unless you are a woman). Men everywhere were gagging on their fish oil capsules. This British medico reflects on this: http://www.drbriffa.com/2013/07/16/my-take-on-the-fish-oil-and-prostate-cancer-study/ It is an example of pitfalls in interpreting scientific studies, especially epidemiological ones. We are about to migrate to a new email system. If my WormMail mailing list goes belly up in the process ….. well, there is always WordPress (although my previous blogging platform – Posterous – was bought then killed off by Twitter). ‘Have you been to WormBoss lately? If you deal with sheep-worms, why not? (unless you like a handicap).